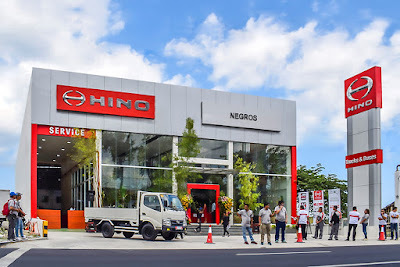 Hino Motors Philippines (HMP), the exclusive distributor of Hino trucks and buses in the country, has officially inaugurated its first Negros dealership in Talisay City, Negros Occidental. Located along the main road northbound of Bacolod, this new dealership is accessible to more Filipino customers and business partners. It is expected to deliver reliable logistic support, demand for which is rising alongside the steady economic growth in the region. The major industries in the region include agriculture, bioethanol fuel, information technology, business process outsourcing, and construction. “We saw the huge potential of the market here nine months ago when we first broke ground in this area. It brings us great pride and excitement to see the Hino Negros dealership being fully operational and ready to serve customers who are in need of a trusty partner for their truck and bus needs. We are confident that the quality we offer will make our products stand out among the medium and heavy-duty truck segments in the local market here,” shares HMP Chairman Mr. Vicente T. Mills, Jr.
As a 3S dealership center, Hino Negros is fully equipped to provide trucking and bus solutions for every customer need. Aside from its showroom facility where Hino’s lineup of products is displayed, the dealership has express service bays, and a dedicated after-sales service facility to accommodate check-up and other maintenance requirements. The dealership is managed by Truckmax Sales and Services, Inc. under the leadership of its president, Mr. Aylwin Y. Yap. HMP has been engaged in the assembly and exclusive distribution of Hino trucks and buses in the Philippines for more than 40 years now. HMP addresses the transport needs of businesses ranging from small and medium enterprises to big corporations by providing safe, durable and reliable trucks and buses.